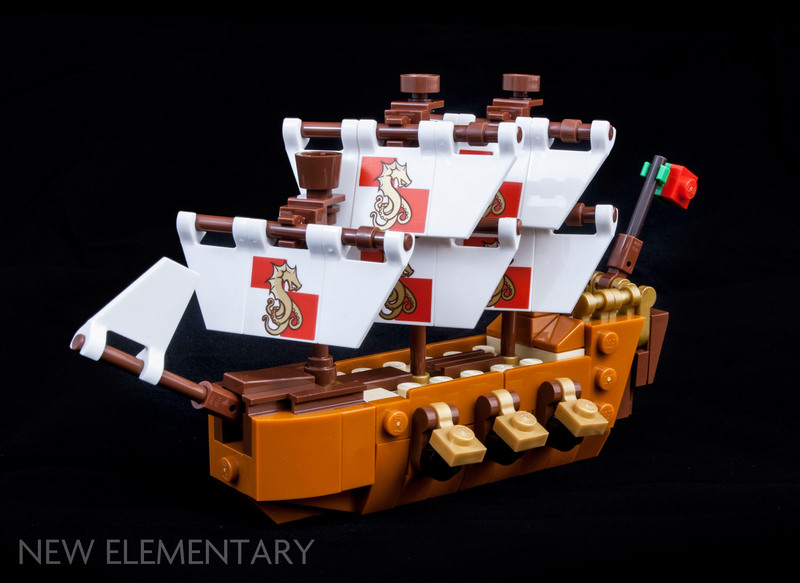 Sven Franic found some surprising things inside LEGO® Ideas 21313 Ship in a Bottle. The set has 962 pieces and is now available, for an RRP of £69.99 / US$69.99 / 69.99€. Another weird and wonderful set has recently emerged from the LEGO® Ideas platform. 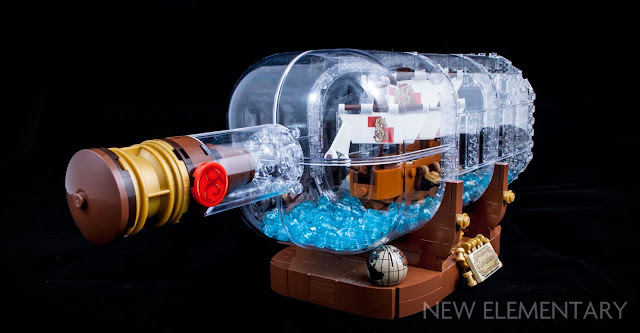 A team effort from fan designer Jake Sadovich and LEGO model designer Tiago Catarino went through what seems like a tough job: adapting a glass bottle into a feasible construction for a set. Even though the supply of available Transparent Clear elements is quite vast, they don’t always work in all applications. 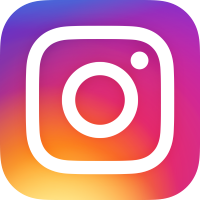 As soon as an element has more than one parallel plane, it reflects more light which poses a greater challenge in creating visually attractive surfaces than simply using opaque elements for the structure. I wasn’t determined enough to count and check, but I believe it must be one of the richest sets in polycarbonate elements (transparent and translucent), both in individual quantity and surface size. Panels are some of the largest single-paned elements available in Transparent Clear and their use was paramount in creating the bottle for the set. 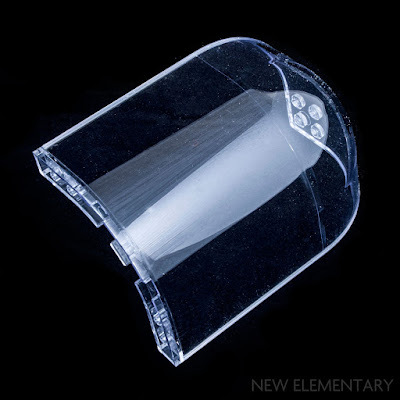 One panel in particular “Panel 6 x 6 x 9 Corner Convex with Curved Top” (Design ID 6225039|Element ID 6002) played a crucial role in shaping the shoulder of the bottle. There was just one problem: this element hasn’t been produced since 1992. 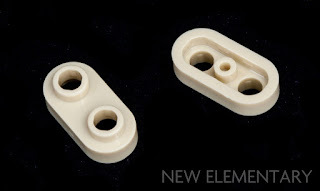 While fan designers can use any element that was ever available to create their concept model, LEGO might need a more convincing motive to dust off 25-year-old moulds. In the official designer video, Tiago mentions that he was able to get the piece reproduced for the set, but I suspect that the piece was planned anyway. 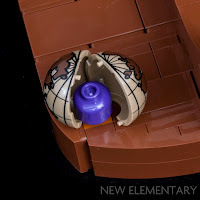 The reason being the flat counterpart of that panel (6201906|2572) made a recent resurgence in 70620 Ninjago City and rumour has it that the Ideas theme is a bit hesitant to create new or revive retired elements. After the set’s adaptation process, the bottle was significantly reduced in size, so the flat panel was not needed and is not included in the set, but how convenient it is to have them both back in production. I feel the biggest shortcoming of the set is the base of the bottle. 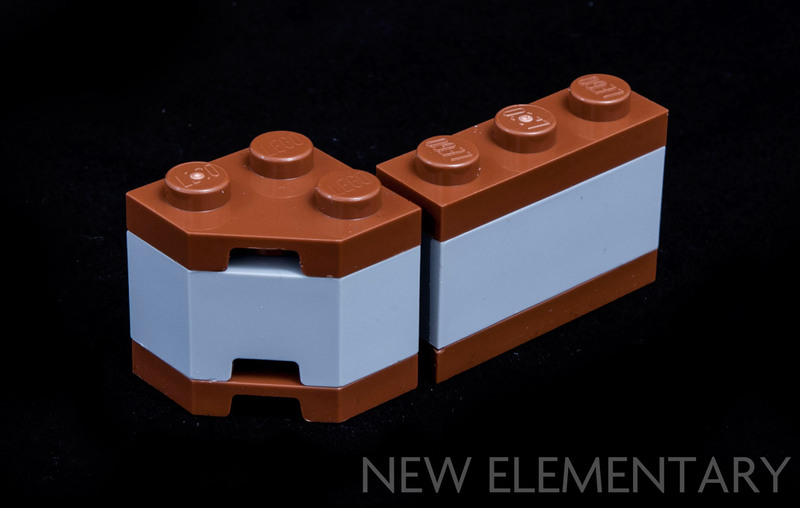 Headlight bricks in Transparent Clear are cleverly used to connect all four sides of the body, but, for some reason, two panels are used in the middle of the base which disrupt the consistency of the texture. The little boat had to be downsized from the initial fan design, not only because the bottle is now smaller, but the boat sits on one of the straight panes of the bottle, while the concept had the boat sitting diagonally which enabled more headroom for the masts. The boat was also stripped of its shrouds, probably because attaching short pieces of string to studs is not considered a legal connection. Despite its small size, the boat is packed with intricate detail and this is where you will find most of the cool new pieces. One of the biggest excitements for me was the introduction of Reddish Brown 1x1 plates with a hollow stud (6215659|85861), sometimes called “Apollo studs”. An extremely useful piece, in a fan-favourite colour. The boat is also home to two of those new 1 x 2 Modified Plates Rounded with 2 Open Studs (6212758|35480) in Brick Yellow[TLG] / Tan[BL] which have recently been discussed in more detail by Simon Liu here on New Elementary. Another fantastic element recently spotted in other 2018 sets is the Plate, Modified 1 x 1 Rounded with Handle in Warm Gold[TLG] / Pearl Gold[BL] (6212377|26047) and Reddish Brown (6153863|26047). 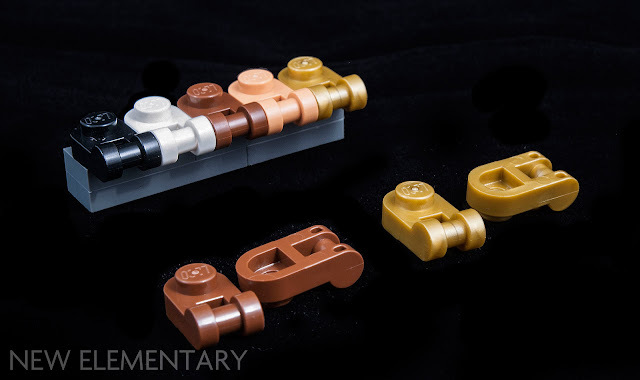 Considering this element’s versatility, I wish it had evolved through the colour palette at a faster rate, but brown and gold are generous enough contributions for the start of the year. Another cool new piece found on the little boat is the Wedge, Plate 2 x 2 Cut Corner (6218366|26601) in Reddish Brown. The piece only came out in 2017, and this is already its ninth colour. 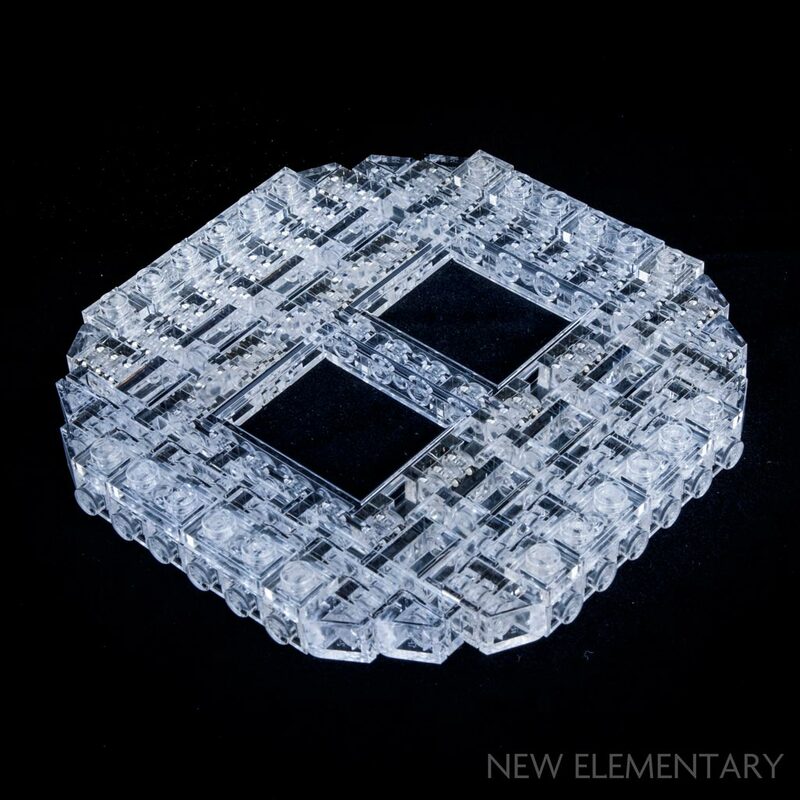 Unlike most wedge plates, this one is cut at a 45° angle which makes it symmetrical to both sides. Some other elements which share this angle are the so-called “facet” bricks and tiles, as well as the 2 x 3 Tile, Pentagonal (22385). and the “Minecraft railway wedge plate” (27928). Let’s have a look at which new elements give the bottle stand its vintage nautical feel. 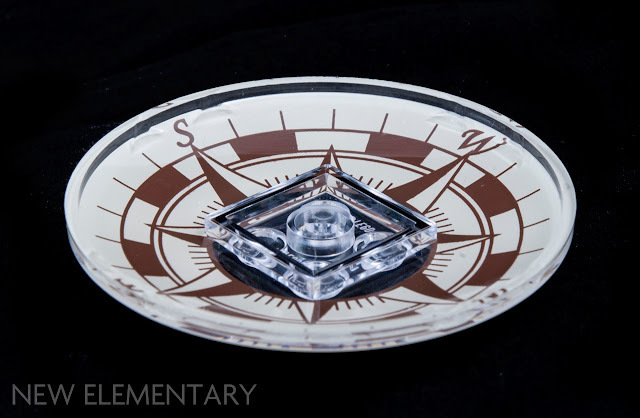 Apart from the obvious compass which I will talk about later, the elements that encompass the compass might be even more intriguing. Recently here on New Elementary, Sean Mayo and Tyler Clites discussed the new Plate, Modified 4 x 4 with Curved Cutout in Black from the new Nexo Knights sets. These plates now also come in Reddish Brown (6228841|35044), a welcome addition to an expanding array of elements which fit into the 4x4 size curve, such as the relatively new 4x4 curved tile. Four of these elements put together form a perfect circle, convenient for fitting any 6x6 round element inside or encasing turntables, wheels and other rotating structures. If for whatever reason you wanted to build SNOT arches, this is now possible. 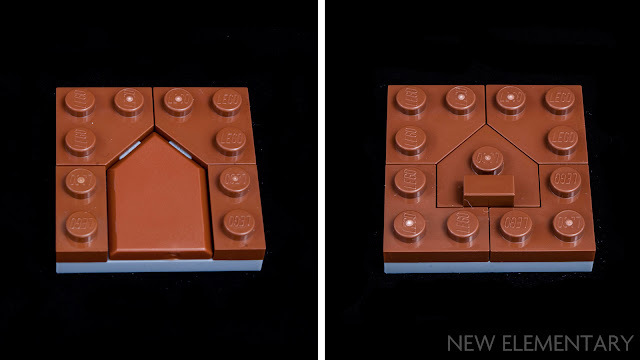 Just keep in mind that actual LEGO arches have a different radius. 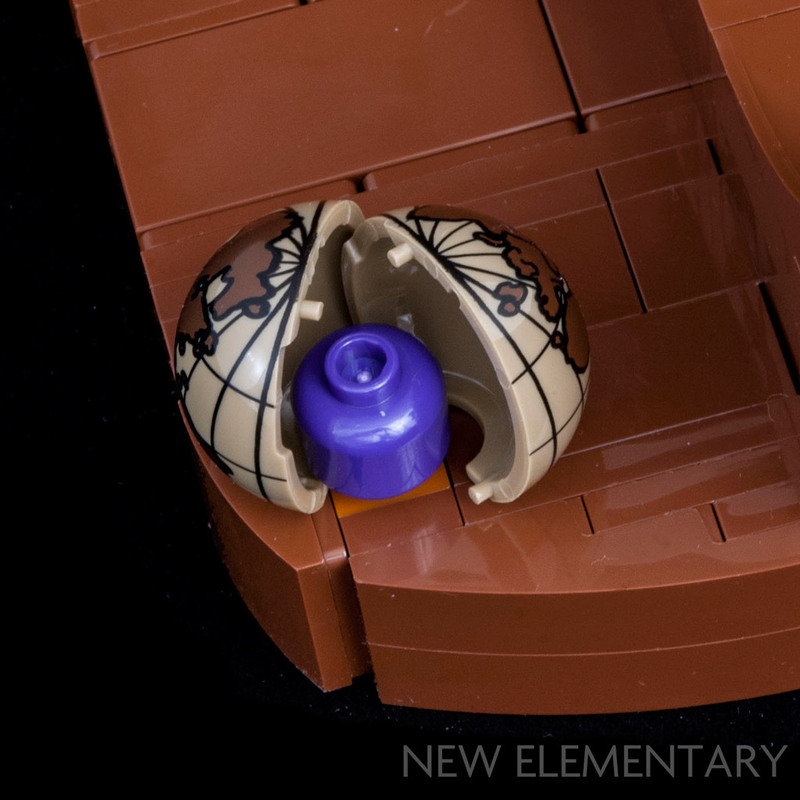 A slightly unusual piece for this set sure to make monochrome minifigure collectors happy is the new Minifig head (6173631|3626) in Medium Lilac[TLG] / Dark Purple[BL] inconspicuously used as holders for the printed globes. The set is also one of the earliest contributors to the 2018 return of Bright Bluish Green [TLG] / Dark Turquoise [BL], commonly known as “teal.” The colour is not visible anywhere in the finished model which means the pieces were produced for other sets. I appreciate designers using attractive new colours for filler parts. 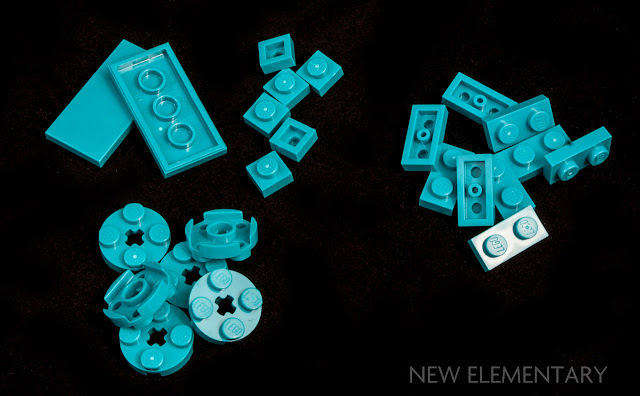 The included Bright Bluish Green elements are two 2x4 Tiles (6223065|87079), six 2x2 round plates (6210400|4032), nine 1x2 plates (6213777|3023) and six 1x1 plates (6213778|3024). All but the tiles have already made an appearance in some of this year’s sets. Ideas sets tend to be rich in printed elements, and this is no exception. 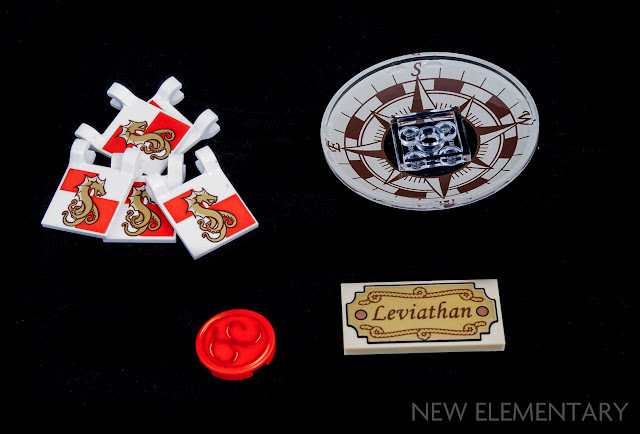 The boat Leviathan has its name plaque printed on a 2x4 tile (6228904), the 2x2 round tile representing the wax seal on the bottle shows the LEGO designer’s initials (6229021), the 2x2 flag boat sails feature a dragon crest intentionally reminiscent of an old castle theme (6231537), and finally the 6x6 Dish with a printed compass face (6229029). 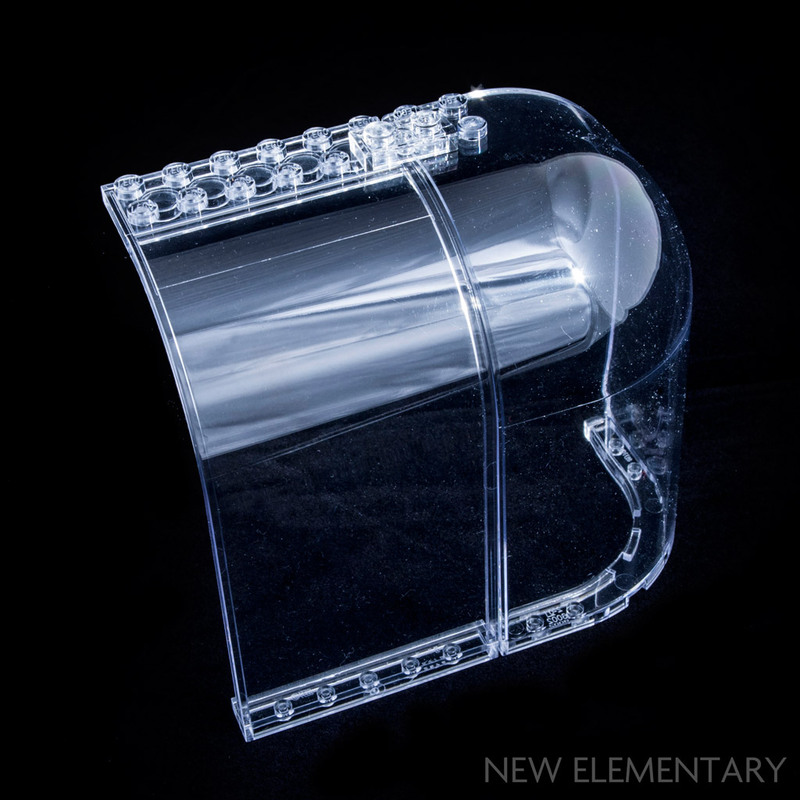 Because LEGO still can’t print on concave surfaces, the compass dish uses upside-down printing on a Transparent Clear element. 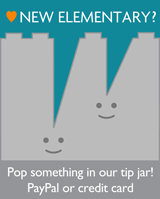 A clever trick which was also previously used for the clock tower in 10253 Big Ben. 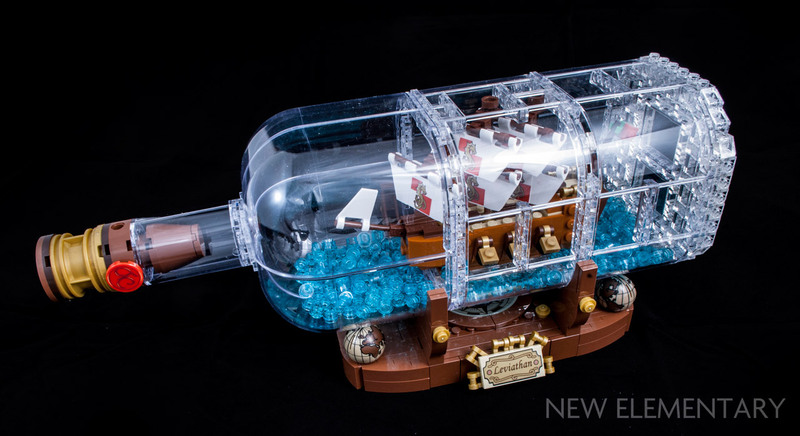 A transparent bottle is an ambitious build considering the medium of LEGO bricks has its limitations, but even with all the compromises, the finished model is an impressive show of potential. 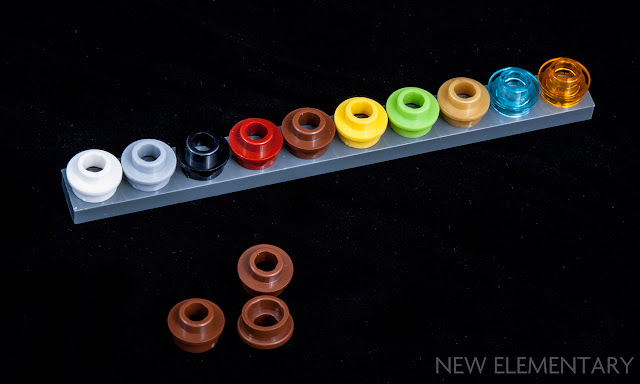 The set introduces a fair amount of new parts and colours, but none that play a crucial role in the set’s execution. 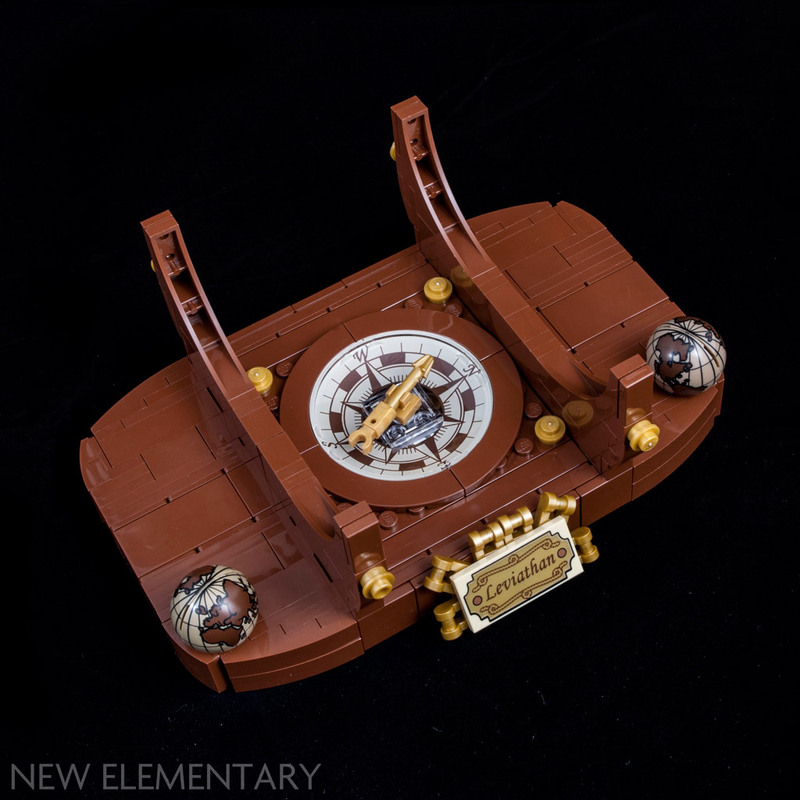 It has definitely succeeded as a beautiful display piece, and if you are anything like those niche fans who tend to appreciate sets for the sum of their parts, I think you will find it a pleasant surprise. It's worth pointing out that while 6002 hasn't been produced in Transparent since 1992, it did appear in Trans. Blue comparatively more recently in set 5985 Space Police Central. Still, that was eight years ago, a fairly long hiatus for a part to be brought back from! You mention that they cannot print on concave surfaces, but don't both UCS Millenium Falcon have the Radar Dish with the printing inside. 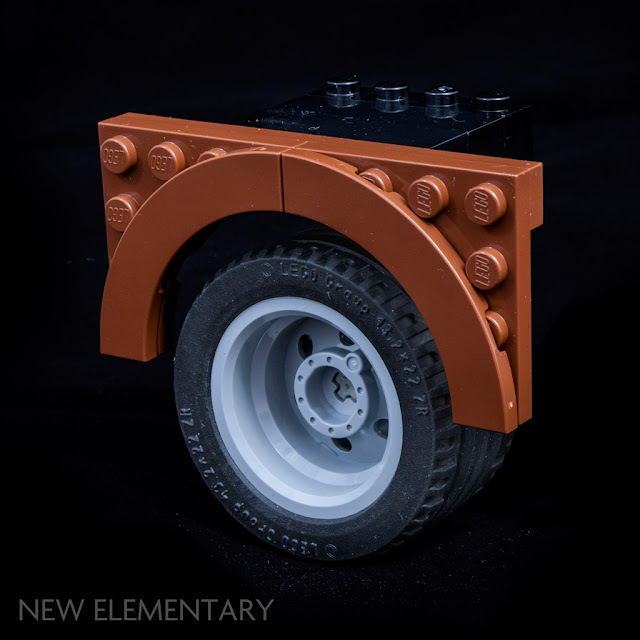 Now, granted, that dish is much larger and less curvy, but I think the reason why LEGO does not print on those surfaces for the smaller ones is because of the lip and the tube in the center. It's why I think they don't print past the knee on minifig legs. I think those edges get in the way of the printing process. I will say that there are the baseplates with the printing over all the studs for islands and underwater mountains and all the others that were made back in the day, but I feel that is also different because those are larger surfaces, it's the smaller things that need to be taken into consideration when trying to print details. Andrew; good point, I was aware but didn't want to complicate too much, I guess the actual mould accumulated dust for only 10 years then. I am just happy the clear ones are back. MCLegoboy: Yeah, you are probably right, there must be another reason why they can't print on the inside of the 6x6 dishes. I don't know how they did the printing on baseplates in the early days like in the Paradisa theme, but the latest roadplates seem to be spray painted in some way. Noticeable if you look at the edges of the print. Apparently baseplates are sub-contracted to another company so it is likely they do the paint application as well. Very nice Sven, it's not easy to photograph those trans-clear parts so well. Did you leave any fingerprint evidence ;-) I had missed that some of the Reddish Brown parts were new, mainly because it sometimes seems such a 'mundane, common' colour that I assume it has already been released! Great review. Incredible shots huh? Sven has a new light tent! It's worth noting that for both UCSMF radar dishes, if you look closely at the print, you can see that it has to be precisely aligned so the pad used to print doesn't intersect the raised plate bottom in the center of the dish. There's a clear oversized square deleted from the pattern in the center. The outer edge is also pulled in from the edge. For the compass, the pattern goes all the way past the outer lip, and intersects all four corners of the center square. Either the pattern would have had to be trimmed to fit, or they had to print on the convex side. Doing the latter would also have the added benefit of making it look more like the compass was enclosed in glass, heightening the aesthetics. On the two Falcons, the same basic effect would have looked terrible, though, so it's not surprising they opted to print inside opaque parts for both. For minifig knees, that would require not just printing on a concave surface, but printing into a precise concave corner. Any deviance, even a tiny bit, and it'd probably smear the fist side that made contact, ruining the print completely. The next alternative would be to print the thigh in one pass, and the shin in another, and that would at least double the cost of printing the legs. Getting right up to the thigh and down to the top of the foot together would be even more complex, since you'd have to not brush either of the adjoining surfaces with the pad or, again, smearing and ruined parts. Or it'd take _three_ passes to print the entire length of the front of each leg, and now the cost gets just ridiculous (it's worth pointing out that it was reported a while back that the printing machines were running at full capacity as it is). Old printed roadplates had the road printed on the "sidewalk" color, so there were no studs to avoid. Island plates and the like did look like they were probably applied as a spray, meaning that not only could the print go right up to the stud, but right over it and even into the logo text. Modern baseplates can actually be pre-printed when they're flat sheet-stock, if you know exactly how the material will stretch when vacuum is applied during the molding process. If you've ever seen printed shrink sleeves on stuff like plastic easter eggs, this is what the high-end companies do to ensure the print isn't stretched or squished during the shrinking process. But, since modern roadplates are solid dark-bley with print between the banks of studs, I think those are either pad printed like other LEGO parts, or printed with a roller like plastic newspapers. The dark purple minifig head actually does appear in Friends as well—specifically as a small balloon in a Juniors set. Curious what else it might appear in. I don't think keeping the globes aligned will be too much of an issue, since it's not exactly a set that's meant to be "swooshable"—once you've found a place to display it, I think it'd be pretty easy to position the globes how you want and not have them shift around too much unless you touch them specifically. I was thinking you had it mixed up with Medium Lavender (I knew that was out recently), but it looks like this Friends set hasn't been inventoried yet. And I do remember it being used as a balloon. But the globes will rotate with any vibrations or movement. There's just nothing about the design that gives it any grip. The keyholes on my travel cases are the same way. The have little plastic collars that rotate around with the key, and the one thing I can count on is that they'll never be lined up correctly when I try to insert the key. It won't be _as_bad_ with this set, since it should indeed spend its life parked on a shelf, but every time you pick the bottle up off the stand and set it back down, you're going to be causing the globe pieces to wobble a bit, and that will cause them to rotate out of alignment. Seeing all the transparent parts, it got me thinking: I'll be building the Warsong from Thor Ragnorok, and I need a very large transparent half-or-quarter-sphere. I've been looking around but the biggest I can find is 9 studs diameter, and I need 13-15. Does anyone know of a piece like this? Or does it just not exist? I'd much appreciate any feedback.